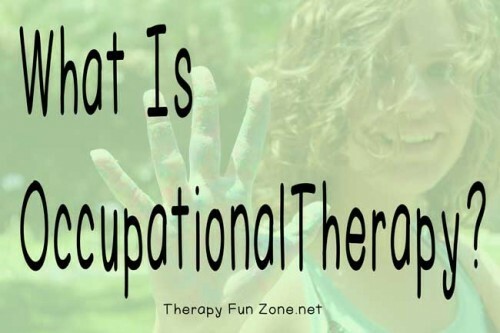 Exactly what is Occupational Therapy? Many people get the wrong impression that it has something to do with finding people jobs, but it does not. Occupational Therapy treats people who have a disability that interferes with their function, or their occupation. The occupation of life is what you need to in order to participate in life on a daily basis. These daily occupations include getting dressed in the morning, eating your breakfast, taking care of yourself and your family, and for children, playing. In order to participate in these occupations, you need to be able to use your hands (so we work on fine motor skills), and we adapt the environment or make equipment to make it easier to achieve the occupation. As Occupational Therapists, we work on so many skills, and much of the time, it can be quite fun to work on the skills. 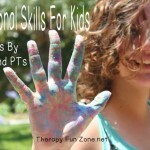 That is my goal with Therapy Fun Zone is to show how to make it fun to work on skills and also to provide a venue to share ideas and treatment approaches. To find posts about specific skills, you can look at the drop down list in the header under activities by skill. You can also find out about each skill area in the drop down menu under OT.